Dimensions (HxWxD): 0.25" x 0.25" x 0.25"
These gorgeous, energetically powerful Super Nova cut Tibetan Green Obsidian Gemstone Post Earrings come from the banks of the Yarlung Zangbo River. The Zangbo is the highest altitude major river in the world, originating in the Tamlung Tso Lake in Western Tibet, southeast of Mount Kailash, one of the most sacred sites on Planet Earth. This beautiful, extremely rare gemstone imparts the unique energy signature of the High Himalayas. Jane and I feel a taste of that "peace that passeth understanding" when meditating with this Green Obsidian, and we feel that there is a reason this particular stone has recently come onto the world markets -- because Lightworkers, meditators and healers definitely need the specific vibrations imparted by this remarkable stone. These Tibetan Green Obsidian Super Nova earrings come in a velvet jewelry box for safe-keeping. The Super Nova gemstone cut originally was unamed and beautiful. We first named this piece a 'honeycomb' cut because of the unique faceting on the stone. This remarkable gemstone style combines two spectacular cuts. On the back of the gemstone is a modified Millennium Cut, a starburst pattern that was created in the early years of the 21st Century by master jewelers to reflect the emerging consciousness of a new millennium. The surface of the Super Nova style gemstone is laced with an intricate pattern of flat hexagons, like a honeycomb or the eye of a honeybee. The compound eye of a honeybee consists of an array of hexagonal visual sensors designed to maximize the honeybee's ability to detect tiny movements in shadow and in the lower, infrared light frequencies, enabling the honeybee to achieve maximum awareness of predator movements in deep shadow and also provides amazingly acute peripheral vision. The honeycomb is also composed of hexagonal cells, which was why at first we called this cut the honeycomb cut, and this unique cut is said to help the bearer to bring to consciousness all the information that is normally held subliminally, in the unconscious mind, or which is in the periphery of consciousness and awareness. These gemstones can help to render the bearer much more acutely perceptive, and to enhance the critical spiritual faculty of discernment, which is so vital to us all in today's rapidly changing, tumultuous global environment. It is difficult to capture both the millennium cut back faces of the pendant and the honeycomb cut in photos, but you can see at least one or two of the hexagonal faces on the surface of this remarkable pendant in these photos. 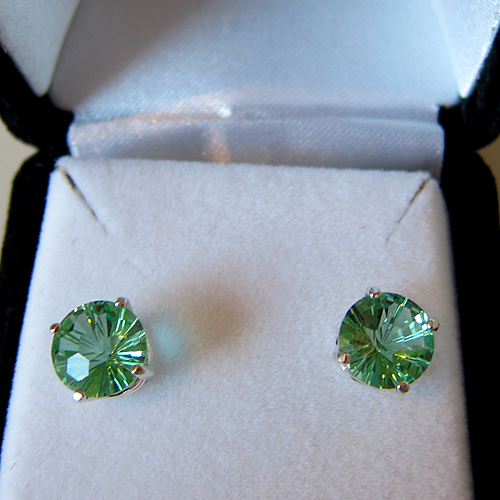 This pair of crystal earrings have been cleaned with Universal Life Force Energy, and given an energy attunement using Reiki, a Japanese technique of energy healing, so it will continue to receive and transmit Universal Life Force Energy direct from the Source of Creation. It has also cleaned and charged with the natural energy of sunlight. It is ready for you to program according to your own needs and desires. Note: Weight above is shipping weight. Actual weight of this pair of earrings is 2 grams. Each piece is unique and may vary slightly in appearance. Each piece is guaranteed to be beautiful and to meet with your complete satisfaction!